UK: This CD is distributed by Pinnacle/Nettwerk. SPAIN: This CD is distributed by DOCK. Previous CD, Betty's Room, was released by Rounder in Europe to critical acclaim, this CD is on Bongo Beat worldwide. Advertising already running in US magazines: Harp, No Depression, Big Take Over, Americana Music Awards, Amplifier, etc. 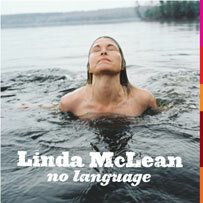 Musicians on the cd have played with Jann Arden, Sarah Harmer, Blackie & the Rodeo Kings, etc..
Linda McLean lives in Northern Ontario; a rough-hewn Lucinda Williams, with taut songs full of fire and emotion not easily forgotten. Her debut (Betty's Room) was distributed by Rounder Europe to critical success (it is not available in North America at the moment, maybe on Bongo Beat next year). Now, with her new album, we're proud to introduce this great Canadian roots artist to North America and beyond. Produced by roots veteran John Whynot (Bruce Cockburn, Blue Rodeo, etc), No Language is an impressive showcase of strong songs and emotive singing. There has been a lot of love and attention paid to craft and feeling; recorded deep in the Muskoka woods at Linda's home studio (that lake she's swimming in on the cover is her back yard) with the full panorama of nature for inspiration. "Music is always with me; even while I studied dance and theatre, I sang songs for friends, covers of the folk songs I'd learned as a child mostly, Bob Dylan and Joan Baez. At school I was most interested in language, and studied English literature, drama and poetry. And while I was a professional actor and an acting teacher, I studied music, piano, voice, composition, ear training. Listening to classical music is what really opened my ears, especially J.S.Bach and Gustav Mahler. All of these experiences contribute to the songwriting I do now." "I opened the doors to my songwriting and the first person I found behind them was my partner. Andy had given up writing songs years before, but when he started helping me with arrangements on a few of my songs, we both realized that the process was bringing out the best in both of us. We started working together; the result is the songs on Betty's Room and No Language. We keep each other digging deeper, raising the bar... We each come in with ideas and the ideas grow as we experiment around chord changes and melodies. Most often I will go off with a melody we've come to love and write the lyrics. Sometimes a lyrical hook will come right with the melody. I've come to understand each song has its own nature. Some are ready and crystal clear, some songs are so quiet I have to listen really hard and long to hear them. I've got to let myself be quiet to hear what the song wants to say." Linda McLean has been a well-kept secret with her fellow musicians and fans in the UK and Europe - now Canada and the rest of North America can experience a new voice on the roots scene, powerful, positive and inspirational. We are very very proud to have her on our label. SIMULTANEOUS USA/CANADA RELEASE ON BONGO BEAT.